Bhote Koshi Rafting is an exciting rafting on the Bhote Koshi River in Nepal. The Bhote Koshi River has very steep and basically non-stop mountain watercourse. 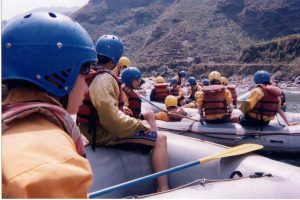 If you have never rafted before and if you have limited time but desire an adrenaline overload, this rafting might be a perfect introductory trip for you. Because Bhote Kosi is probably the most exciting short rafting trip in Nepal and best white water adventure in the world. People describ Bhote Koshi Rafting as “Like a pinball Machine and you’re the ball”; “Like being flushed down on open air toilet”; “Expedition River” etc. With Bhote Koshi rafting you also get the chance to observe emerald green fields are terraced high above the river on precipitous slopes, curious villagers lining suspension bridges are amazed as you plunge through cascading waves. The rapids here are a solid class 4- 5 at high flow, and a more classic 3 at lower levels. This true adventure rafting in Bhote Koshi will be between October -December, and February – April. Excellent Himalaya Trek & Expedition organize Bhote Koshi rafting trip in group joining and private basis both. For the private trip, it needs minimum group size of 4 pax and above. Day 01: After breakfast drive from Kathmandu to Khadichour along Araniko Highway, the rafting starting point, 80 km and 2:30 hours drive. Before rafting our guide briefs you on the raft and river. Wear on life jacket and helmet. Then set off water journey. Nearly 10 km of continuous whitewater rapids we will arrive at Sukute. Lunch. Then drive back to Kathmandu. Day 01: After breakfast drive from Kathmandu to Khadichour along Araniko Highway, the rafting starting point, 80 km and 2:30 hours drive. The first day we will do rafting in the lower section of this river. Before rafting our guide briefs you on the raft and river. Wear on life jacket and helmet. Then set off water journey. Nearly 10 km of continuous whitewater rapids we will arrive at Sukute. Lunch. Leisure at river beach. Dinner. Overnight stay at the camp. Day 02: After breakfast, we will back to the Baseri (Upper Section) hit class 4 rapids and stop at Lamoshanghu Dam. We have lunch over there and back to Kathmandu by private transportation. Please contact us for any further information, price, and booking of Bhote Koshi Rafting.